The wood-fired lamb at Wit & Wisdom. That’s me. Taking it all in. I’ve never been one for fancy restaurants. Don’t get me wrong, I love great food and service but I can do without the formality. I suppose I’m more of a Peter’s Inn or Corner BYOB kind of girl. So, this was my first time at Wit & Wisdom and I wondered…what would a girl from a tiny town with two traffic lights who now lives in the land of hipsters and pink flamingos identify with there? I figured that out pretty quickly when I visited for dinner a few weeks ago. It was pretty eye-opening actually. First, everyone we encountered was approachable and warm, but definitely at your service. From the friendly and creative bartender, Adrian, who made us the most delicious cocktails to the sommelier John who perfectly paired wines with our meal to the executive sous chef Kosta Kontogiannis who was a lovely host and prepared such an amazing feast for us – they all were simply amazing. Friendly, welcoming and eager to please, this group of professionals put me at ease as soon as I walked in the door. 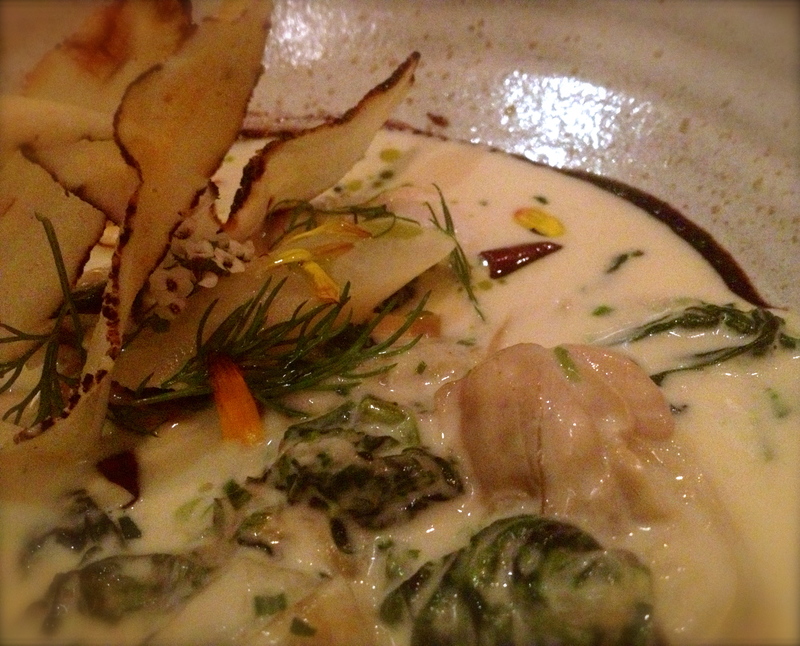 But then, it is the Four Seasons – service is what they do. We started out with a couple of cocktails (I had The Company and my friend, the Sticky Wicket), a gorgeous charcuterie plate and Maryland blue crab deviled eggs topped with shallot “cracklins.” Another friend told me that she loves the Jalisco Sour – espolon tequila, aperol, fresh lime, agave, grapefruit marmalade, over ice with fresh cinnamon. I’ll get that next time! 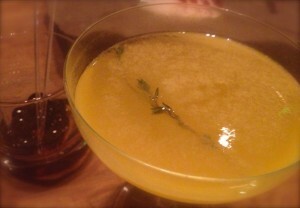 “The Company” – saffron-infused Beefeaters gin, honey, fresh lemon, orange bitters and a sprig of thyme. Apparently, I like gin now. Not sure when this happened, but probably when I started trying all of the great liquor infusions popping up in restaurants around Charm City in the last few years. 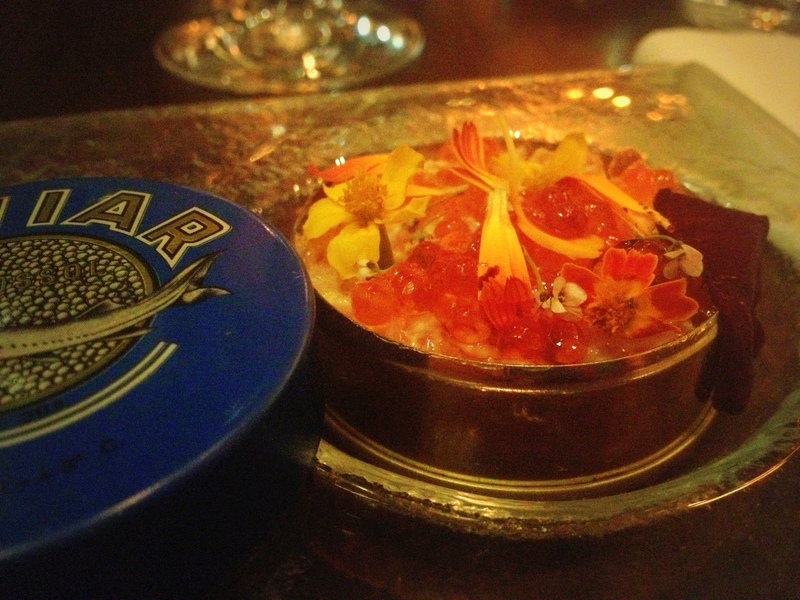 Then…smoked salmon with trout roe served in a beautiful caviar tin. 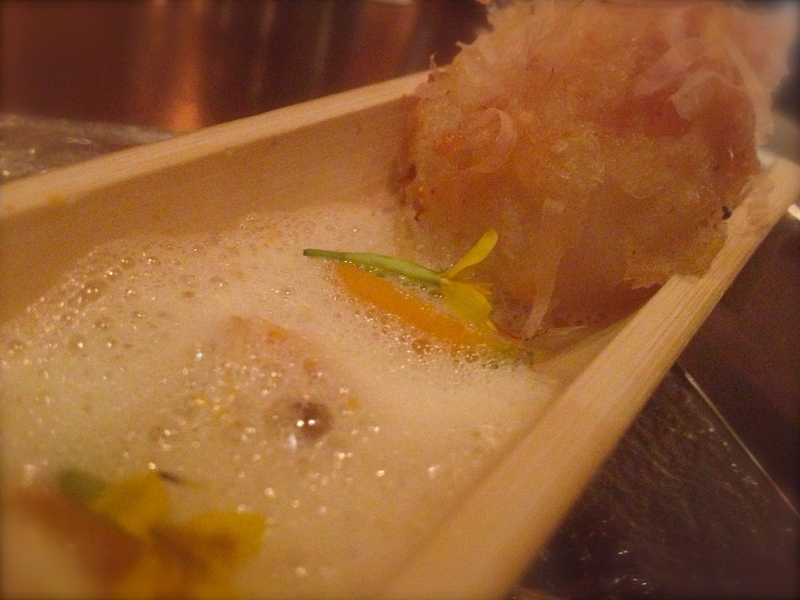 The flavors were subtle, it was the perfect amount and the presentation was really elegant. Loved it. 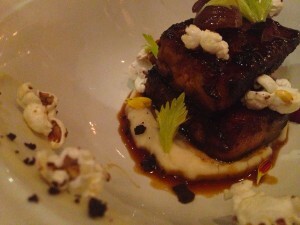 Next up, the “Vanilla Belly” – 24-hr braised vanilla pork brisket. Yes, that is popcorn you see as a garnish. That was a fun surprise…lighthearted, not taking things TOO, too seriously. It was served over celery root with chestnuts and black olives. Very interesting combo…not one that sounds like something I’d enjoy it, but I was way wrong. My friend and I darted back and forth with our fork, trying to get one more bite while the other chewed happily. 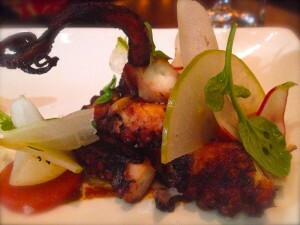 The charred octopus was a really striking plate. It makes me crazy when people say something is so pretty they don’t want to eat it…EAT IT! But, I felt like that at first. 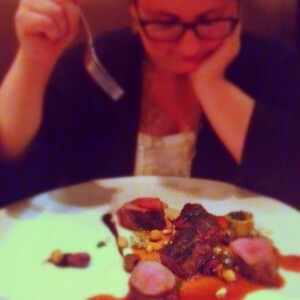 I kept looking at it, turning the plate, appreciating the ingredients and garnishes. But eventually, you’ve gotta dig in. Liked it a lot. Then, they did me in with the lamb entree. It’s wood-fired lamb loin and leg with Swiss chard cannelloni, dates and lamb jus. OH, the jus! I’m in awe of chefs who make amazing sauces because as a home cook, I feel like I don’t have the knowledge and finesse to really master them. So, when I go out, I just marvel at them…and I clean the plate. Completely. This was no different. See photo at the top – that’s me, marveling. Dessert…oh, man. This is a place to absolutely order dessert. Sadly, I’m not a huge dessert person – it has to sound amazing for me to order. And that’s where Chris Ford comes into the picture. I’ve enjoyed his desserts on my visits to PABU, which is also in the Four Seasons. 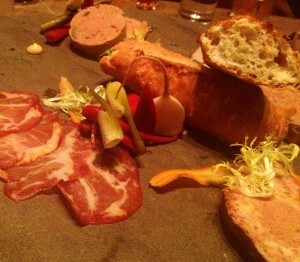 When my best friend and her husband visited from Paris in December, we went to PABU for dinner. Not only did we enjoy sake, happy spoons, sashimi and grilled meat skewers, we had the “Coffee & Cake” for dessert which is devil’s food, espresso curd and brown butter coffee sherbet. 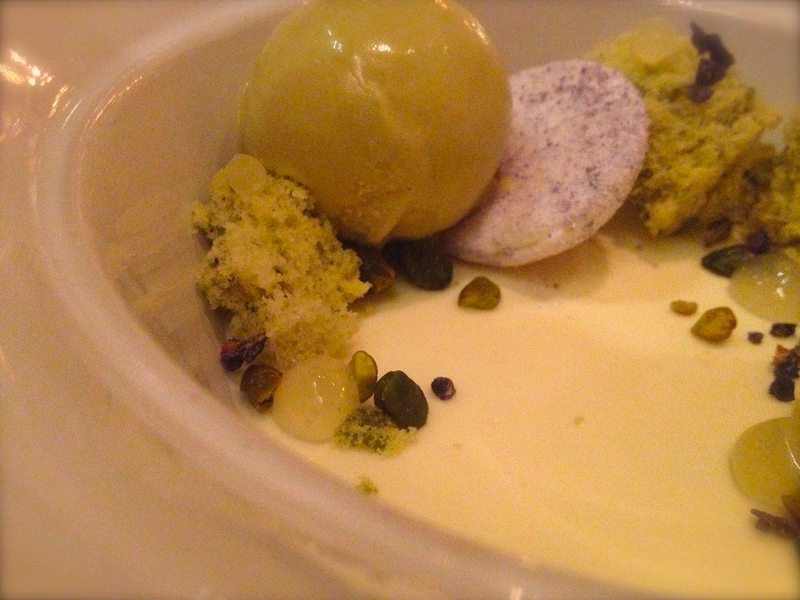 As Baltimore Orioles outfielder and food lover Adam Jones would say, “We smashed it.” And at Wit & Wisdom, my friend and I had the “Meyer Lemon” – meyer lemon panna cotta, pistachio sorbet, violets and pistachio sponge cake. Loved it so much. Perfect flavors together, not too sweet and just the right portion size. I’m not a big fan of “so big you get to take some home.” If you want to try more of Ford’s desserts, be sure to visit LAMILL Coffee in the hotel. Best macarons and beignets. And, add a delicious and beautiful cappuccino by barista Becka Downing? Happy girl. After dinner, we had the chance to visit with Chef Kosta for while. What a great guy. We talked about local food sourcing, butchery, his journey to Baltimore and more. He made us feel so much at home. So, I guess the point I wanted to get across by writing this is that Wit & Wisdom might seem uptight and stuffy, but to me it’s the opposite. The people there, their modern approach to comfort food, the way they make you feel at home as soon as you sit down. I like it. 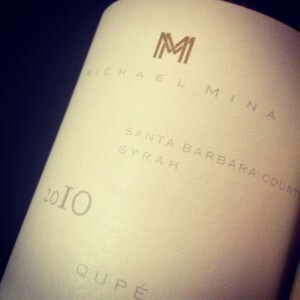 Yes, it’s expensive but it’s worth a splurge for a special occasion or a treat after a rough day. 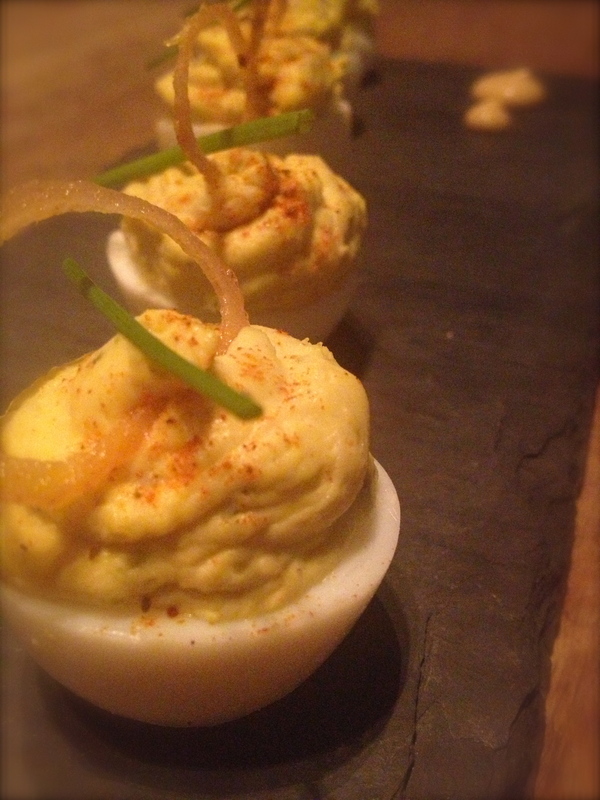 Or, do what I plan to do next time…get there early, sit in the lounge and enjoy the happy hour specials. Oh, and that gorgeous view.